I love this recipe. It is simple and tasty. You can either freeze it or can it. This batch below, I ended up freezing. 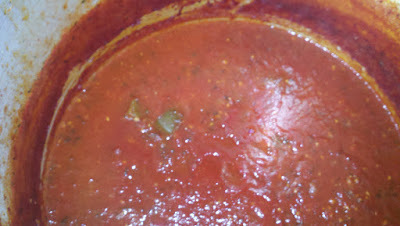 Please note that this picture was taken after the sauce had reduced between 4-5 hours. To remove skins, wash tomatoes and dip in boiling water for 30 to 60 seconds or until the skins begin to split. Then dip in cold water, slip off skins, core and remove any blemished or discolored parts. Cut into quarters and boil in a large uncovered pot for 20 minutes, press through a sieve or food mill. In a heavy sauce pan or cast iron skillet, saute garlic, peppers and onions in oil until tender. Combine with tomatoes and remaining spices and bring to a boil. Simmer uncovered until thick enough for serving. Volume will be reduced by almost one-half. Stir often to prevent sticking. Pack hot jars with hot prepared tomatoes mixture leaving 1-inch had space. Remove air bubbles. Wipe rim and screw threads and adjust lids and screw bands. Dial gauge type @11 pounds pressure of Weighted Gauge Type @ 10 pounds pressure at 1000 feet. Wow!! Looks good! I read your recipe! 30 pounds of tomatoes! I almost fainted! haha, I don't think we even grew 30 pounds this summer.